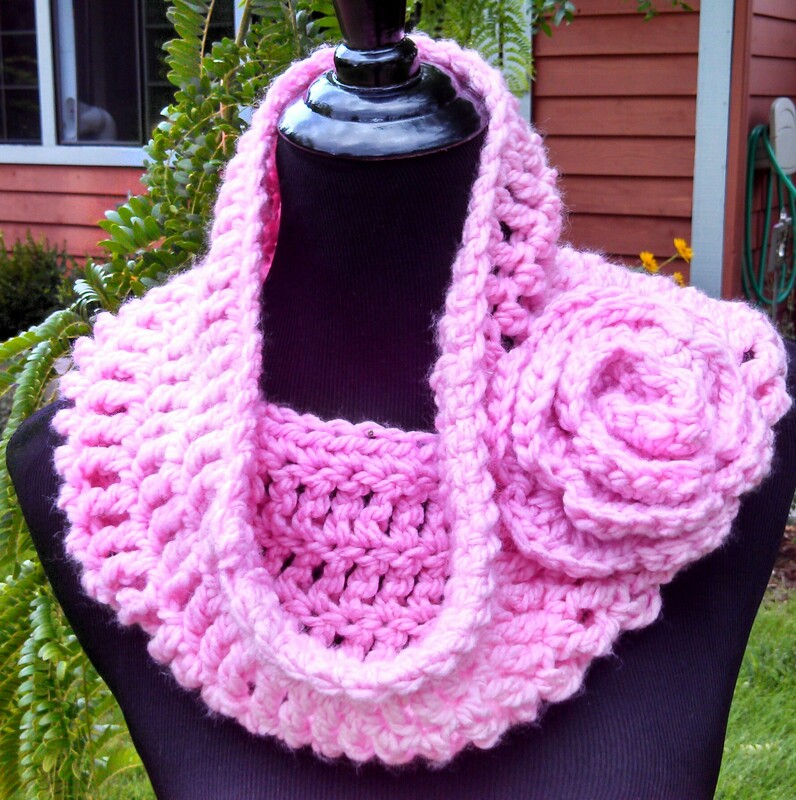 Soft and Stylish Cowl… Free Crochet Pattern!
. Extra Bulky Yarn (5 or 6 by Yarns Standards) 150 yards- Different types and weights of yarn will produce varying results. If you love this pattern you can add it to your Ravelry queue and favorites… Click Here!!
. This pattern is worked in the round and no turning is necessary unless otherwise noted. Ch 50-55 depending on your desired diameter, Join with Sl St to beginning Ch. When joining chain, be very careful to keep the chain from twisting. The joined Chain should be a continuous circle once joined, (See illustration below). Row 7: Ch 2, HDC around. Join to top of Ch 2. Finish off, Weave in tails. Row 1: Ch 2, 6 Sc in 1st Ch, Join to 1st Sc. Flower is worked in the round unless otherwise noted. Row 5: The Petals… Ch 1, Turn. 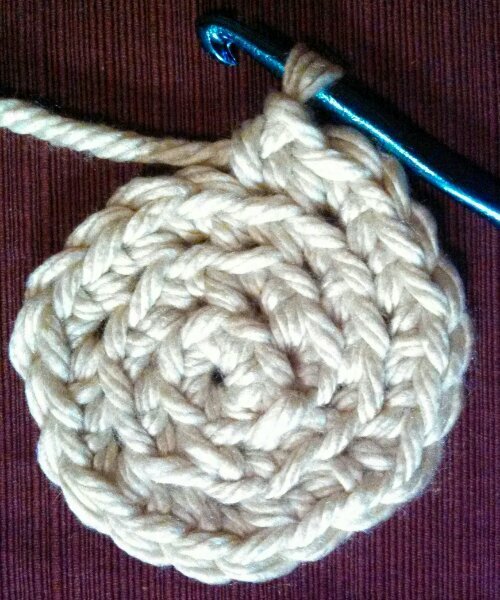 Sl St, Hdc, 3 DC in Ch 3 Space,* Sk Sc, Sl St in next Sc, Sk Sc, 5 Dc(7DC if using Bulky Weight 5 yarn standard) in next Ch 3 Space*, * *11 Times, Sl St on back of flower base approximately 1 inch away from last petal made to secure flower. 12 Petals. Finish off leaving long tail for sewing flower to Cowl. 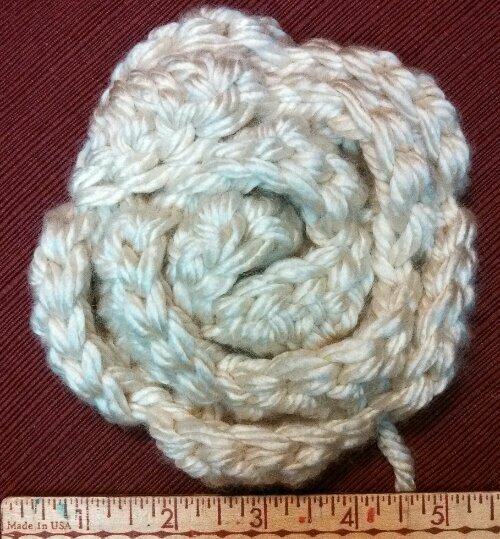 Sew Flower to cowl using yarn needle. this is really neat! I love the cowl! I was very surprised that the pattern was on here. That is so cool!!!!!! Is there anyway to print this pattern without all the pictures to save paper and ink. 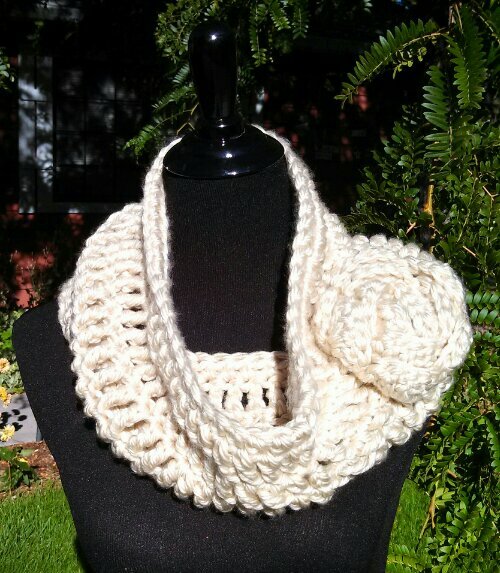 I’ve been waiting to get this free cowl pattern but hurry, it’s only for a limited time! Love the cowl! 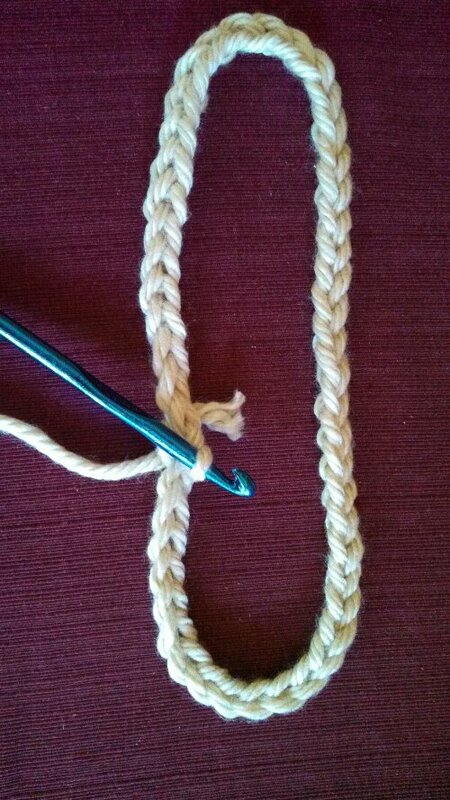 Can I ask, when I have joined the first round and then chained 2 does the first hdc go into this stitch or the next one? It goes in the next St,,, the ch 2 or ch 4 is listed as the counting as the first HDC or first TRC now and throughout… This always means you treat that as the first st and work the next st in the following st… Thanks for asking!!! Hope you love your cowl. I know… It is always confusing!!! I taught Crochet for a Jr college… That is always the hardest area to teach a new crocheter… then,,, if the pattern is unclear it is a mess… I always put the st count at the end of the row… thats what confirms I am doing it right when I am unsure of the pattern… Thanks again for trying my pattern! Thank you! You can make the cowl for personal use or make and sell the cowls… If you do sell them please just link the design back here… The pattern is free for a limited time and for personal use only, so please dont distribute the pattern. I hope you enjoy making them and if you sell them… Good luck on your sales! Wow… Thank you so much!!! Your Link and Share is truly a blessing! 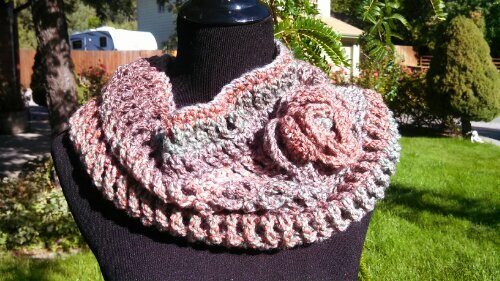 I really like this cowl n you showed it in my favorite color purple. What yarn did you use! Thank you so much for giving this pattern free! What a blessing for us seniors. Oh thank you for your kind words! I am so happy you and she likes it! 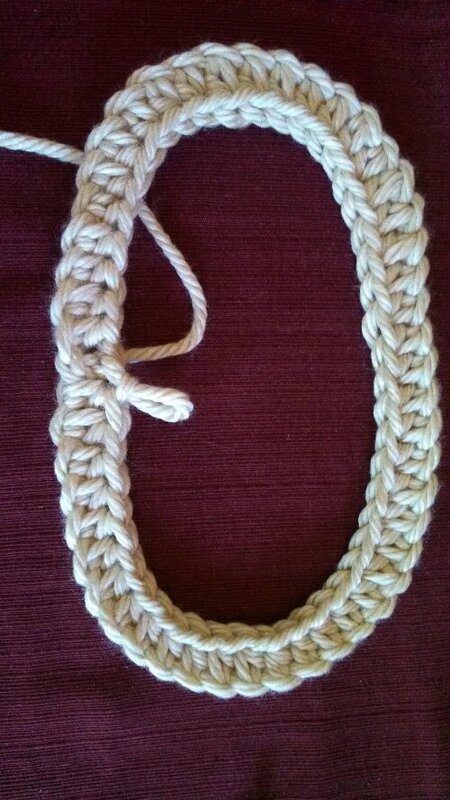 Glad you figured it out… I hope you enjoy your cowl! 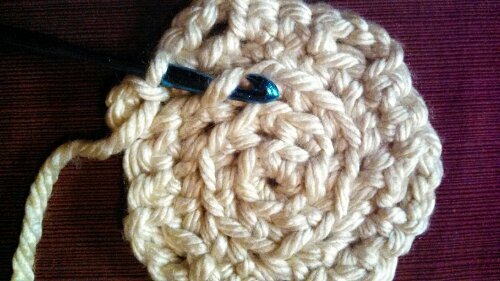 been crocheting and knitting for quite a few years, and it is therapy for my arthritis in my hands, and my mind, it works well on all kinds of moods, (ha). I always take my bags with me when we go anyplace, and used to be that my husband complained because I was always taking my bags, but now, he does not, because he knows where ever we end up, I am satisfied to have something in my hands, while he is doing his thing, thanks again. look forward to hearing from you again, my email, is [email protected], would love to hear about something new and easy, thanks again, and have a wonderful week-end. I will be posting new patterns soon and we will all be doing a crochet a long together in January… Maybe you can participate. OMGOSH!! I am absolutely in love with this. 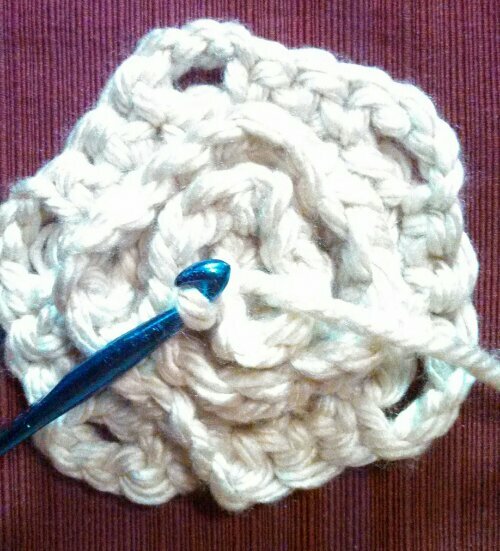 I am new at crochet and am blessed to have a mother in law that will spend the time to help me with this. It will be beautiful for my daughter. Thank you so much for sharing this with us. Thank you!!! I am so glad you have someone to help you!!! This is adorable! I would love to crochet for my grandaughters! Thanks for sharing this with us! You are welcome,,, and Thank You!! I want to know how long the cowl should be to look like the picture. You can copy and paste the section you want off my page (the pattern part only) and drop it into a word document… That way you only have the part you want. Just finished this cowl in black & I love it!!! I used Lion Brand Hometown USA. Just discovered this yarn. So soft. 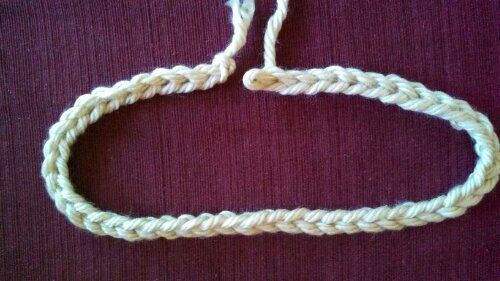 Using 2skeins I was able to make the cowl & hat to wear to church tomorrow. Had a bit of a prob understanding the flower, but with persistance, I came thru. Thanks for the pattern. Will be making a lot of these. Yay… so glad you liked it … I love hometown usa… I have used it several times… Yes the flower is a little tricky but once you get it it will be easy…Thank you!! Hi, each time I click on the green Free Pattern link (associated with the lovely pink infinity cowl) – it directs me to the Kelly Blue Book page. I’d like to be able to save the pattern. TIA. That is an advertising link from an outside source… You dont need to click on anything on that page to get the pattern… it is all on that page..
Great… Any flower will work… I bet your is perfect!! No,,, I dont have the yardage separated… But the flower is only a small portion of the total. Thanks for hosting once again…Love participating!! !